U.S.S. Enterprise upon departure Nicknamed 'Bones' by his longtime friend and commander, Captain James T. Kirk, McCoy replaced Mark Piper as chief medical officer in 2266 on the original five-year mission but clearly became the most renowned. By that first year he had already won the commendations of Legion of Honor, awards of valor, and was decorated by Starfleet Surgeons. His temperament was sometimes argumentative, a cynic's outer crustiness masking deep caring beneath the surface. His "old South" roots led to the old-time physician manner of doctoring, with a Southern accent that was most apparent when under stress. He distrusts transporter technology and travels by shuttlecraft whenever possible. McCoy was married once and later divorced, a relationship never discussed except for his one daughter, Joanna, who later graduated from nursing school. In the era before ship's counselors, McCoy played his role as psychologist expertly to the hilt - especially for the ship's two senior officers. As such an emotional watchdog he was not afraid to take on his captain, but it was his running battle of wits with Spock which became legendary. Spock showed his true feelings, though, as when inviting McCoy down to Vulcan for his "wedding" and in storing his katra with him before a known suicidal saving of their ship before the Genesis detonation. McCoy contracted the always-fatal xenopolycythemia and retired from Starfleet in 2369 to spend his remaining days on the asteroid ship, Yonada, and that world's high priestess, Natira - whom he soon married. By exploring Yonada's computers, Spock found a cure for xenopolycythemiaand McCoy left Natira to return to the service. Earlier, McCoy had been infected with the strange 'aging' virus that infected the Gamma Hydra IV landing party. After the U.S.S. Enterprise's triumphant return from its five-year mission, McCoy retired from Starfleet, grew a beard and went into virtual seclusion with a rural practice, only to be forced back to duty by Kirk and Admiral Nogura when V'Ger threatened Earth in 2371. After that he continued through the years of renewed Enterprise service with Kirk until at least the Khitomer peace talks of 2293, having survived imprisonment with him on trumped-up charges at the Rura Penthe mining prison when he could not revive assassinated Klingon Chancellor Gorkon. Spock's deposit of his katra in 2385 had nearly driven him crazy and landed him in Starfleet detention until the refusion took place, whereupon he delighted in the Vulcan's reeducation process. As a retired admiral he remained active in his later years, serving at the age of 137 and shuttling aboard the U.S.S. Enterprise-D in 2364 in his role of inspecting medical facilities on new starships. 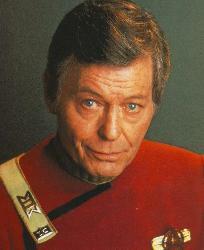 McCoy was an active practitioner well before his Starfleet days, of course. In 2253, some 12 years before he signed aboard with Kirk, he had developed a neural grafting procedure employing the creation of axonal pathways between the graft and a subject basal ganglia that was still the practice over a century later. He had also been stationed on Capella for a few months and knew the intricate customs of the Ten Tribes there.